Torks Screws, were first developed in 1967 by Camcar/Textron and the Torx Drive System was patented by them. 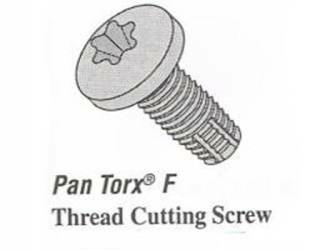 Seventeen years later (1983/1984) when the patent expired for Torx Screws, many manufacturers started making Torx Drive products, but because Camcar/Textron maintained the trademark "Torx", the new products were called 6-Lobe Screws. On this Website we have both, the genuine Torks Screws and 6Lobe Screws, also sometimes referred to as Star Drive Screws. We believe that we have the largest inventory of Torx® Drive screws on the PLANET. Have you always wanted to own Torx Drive screws, which are reported to be 5 times better than Hex, but could not afford them? Now is your chance! Click on the button below and give your name, address and phone number to get your paper catalog. This website has many pages, but the first three pages make your search easier and quicker. The first page, in traditional website design, is called the HOME PAGE or sometimes referred to as the Landing Page. The second page is called the ABOUT PAGE and it is technical information for you, so you can make an intelligent selection of the screws that you need. If you already know the details of the screws that you need, you can go directly to page three, the SEARCH PAGE, to find what you need. You can go to the Search Page by clicking on any of the pictures above, which will take you to the ABOUT PAGE and then you can click on the pictures on the ABOUT PAGE and be taken to the SEARCH PAGE or you can skip the ABOUT PAGE and go directly to the Search Page by clicking the appropriate Push Button that will take you there. You can shop for Torx Screw / Torks Screw Products by clicking on any of the pictures above or Search Our Store for Torx Machine Screws, Torx Cap Screws, Torx Thread Forming Screws, Torx Thread Rolling Screws, Torx Self-Tapping Screws, Type F Torks Thread Cutting Screws and Type 23 Torx Thread Cutting Screws. You can also Browse Our Store catalog index for other types of fasteners that exist in our 14 specialty stores. These Hexalobular Screws are also called Torx Thread Rolling Screws. 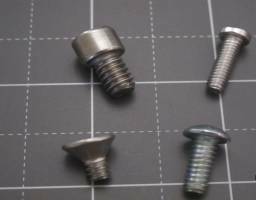 which are often referred to as Torx Sheet Metal Screws. They come in Type A, which have wood screw type threads with a sharp point and the Type AB, which is essentially the same as the Type A but has about 10% more threads. which are often referred to as Type F Thread Cutters. 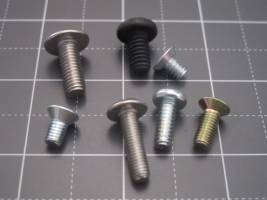 These screws are also referred to as Torx Floorboard Screws. Torx Screws and Torks Screws are becoming a world standard. It turns out that most metric oriented countries such as Europe and Asia have fully embraced the Torx Drive System and most other screw drive system forms are becoming obsolete. The worldwide automotive market has adopted the Torx Drive System almost exclusively. In 2005 an ISO specification was released for worldwide consumption as ISO 10664. It specifies the shape and basic dimensions of the hexalobular internal driving feature for Tork Bolts and Tork Screws, including the gauging method. This specification is intended to provide the details necessary for inspection of the hexalobular driving feature and is not necessarily suitable as a manufacturing standard. If you are interested in getting a copy of this Torx Screws / Torks Screws specification, we will send it to you at our cost of $70.00 USD as we are unable to copy it due to the restrictions of copyright law. Features and Benefits of the Torx Drive System. Torx Drive System features a 15 degree drive angle which provides high torque transfer. Radial forces are drastically reduced resulting in longer tool life. The Star Drive Screws has been reported to be five (5) times better than an equivalent Hex Socket Drive Screw. It has vertical sidewalls which increases tool engagement. Unlike cruciform (Phillips) drive systems, no camout forces are created to push the driver up and out of the fastener recess. Since camout is virtually eliminated, little or no end load is required. Ergonomic studies have shown the Tork Screws of the Tork Socket Drive System can reduce fatigue and muscular stress during the manual assembly of fasteners. The recess completely encloses the drive bit, minimizing tool slippage and the damage and injuries it can cause. CAMOUT is defined as the force upward on a screwdriver as the torsional force is increased in order to tighten the screw. Torx Screws do not have camout problems. For Phillips Drive Screw, you must bear down extremely hard in order that the screwdriver will not rise up and leave the recess altogether. Because of the large angle on cruciform (Phillips) screwdrivers, it becomes virtually impossible to bear down hard enough to keep the screwdriver in the recess in some cases. When the screwdriver cams out, it will usually damage the recess of the screw and because of the pressure applied, it can damage the surrounding material around the screw. The two problems of driver fatigue due to having to applying such high pressure on the screwdriver and the large angle of the cross recess (Phillips) screwdriver is solved with the Torx Socket Drive System. The small angle of 15 degrees for the Tork Socket Recess virtually eliminates	CAMOUT and reduces significantly the pressure required to keep the screwdriver in the socket and therefore reduces operator fatigue. Let Aaron's 15 website stores be your single source for Torx Drive System products. 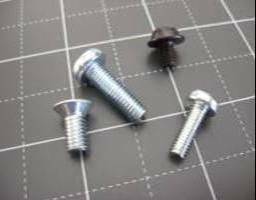 We have dedicated this web store just for Tork Screws users. Over the past 10 years we have processed over 24,000 customer orders and many of those were for Torx Screws. However, a significant number of our customers insist on calling Torks Screws either Trox Screws or Torq Screws. Therefore, we built this web site for those customers who want to use the name Tork Screws or Torks Screws. This Tork Screws website shares the same database with Aaron's 6-Lobe Screws, but you can place your orders right on this web site. We now have three website stores dealing with Torx Screws, 6-Lobe Screws, 100 Degree Flat Head Six Lobe Screws and this web site for the convenience of ALL of our customers. If we do not have the item you want in our current inventory when you place your order, we will manufacture it and guarantee you that we will have it in inventory the next time you order that item. We are currently running at a 96% fill rate in our warehouse and our manufacturing lead time is as little as 10 days for small quantities in really urgent circumstances. We are experts with the Torx Drive System and we can help solve any of your fastener problems and help you to convert from some other drive system to the Torx Drive System very quickly. Our technical staff can also help you solve technical problems in special applications. It is our prediction that Torx Screws will become the defacto standard in the US in 15 years and in the entire world in 25 years. We already have over 40,000 different head styles, sizes and material which results in over 55,000,000 screws. We accept Torks Screw orders by phone, fax, e-mail and online at all 15 of our web stores. We accept American Express, Discover, Visa and MasterCard credit cards and we offer net 30 day terms to anyone who has credit approval through our credit department. If you need a quote by e-mail, Click Here. These fasteners are normally sold to distributors and OEM's in carton quantities. A carton may be 10,000 pieces for a physically small item but may be as few as 2,500 pieces for larger items. Our warehouse operates a "breakdown facility" where cartons are broken open to ship quantities of 10, 100, 1,000 (or multiples thereof) but major discounts are given for full carton orders. Because we are a volume warehouse supplier of Torx Products, we reward customers for volume business. Shipping charges are calculated automatically while you are in the buying process. After you press the "Checkout" button a new screen will ask for shipping method, billing address and shipping address. If you are in California, there will be an automatic sales tax added unless you complete the tax exempt window in the shopping cart. If you should want to try different shipping methods to get the one best suited for you, simply click the "Back" button on your browser, change the shipping method and click on "Continue". If you want to try still another shipping method for your 6Lobe Screws Products, simply repeat this procedure. "TORX® is a registered trademark of Acument Intellectual Properties, LLC"